Do you love weaponized chainsaws, nearly fanatical militarism and vaguely Roman class hierarchies? 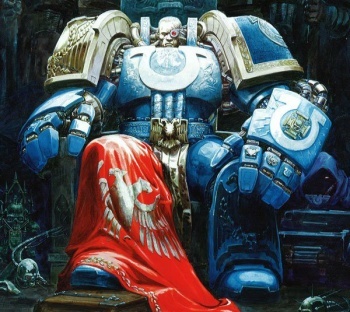 Then you're no doubt giddy that tabletop gaming mainstay Warhammer 40,000 is finally getting the movie treatment in the upcoming Ultramarines. While I'm hoping for an extremely high-concept film about the trials and tribulations of tiny pewter figurines, the feature-length CGI film probably hews closer to typical action movie ideals, especially since the movie's official site describes it as a "70 minute sci-fi thriller." Unfortunately, that's the most descriptive the site gets, but anyone who has played Warhammer 40,000 (or, for that matter, StarCraft) can probably guess that Ultramarines will include, in no particular order, tons of violence, latern-jawed, hypermasculine soldiers in oversized body armor, and legions of (most likely) unfriendly Orks. No release info has yet been offered for the film. Actually, all we really know for sure is the title and that it is being produced as a joint project by Games Workshop and British film studio Codex Pictures (the same people behind the Lego Bionicle DVD movies). You can fill in all the other details with your own imagination, though I understand how hard that might be without the aid of a few hundred tiny metal figurines.